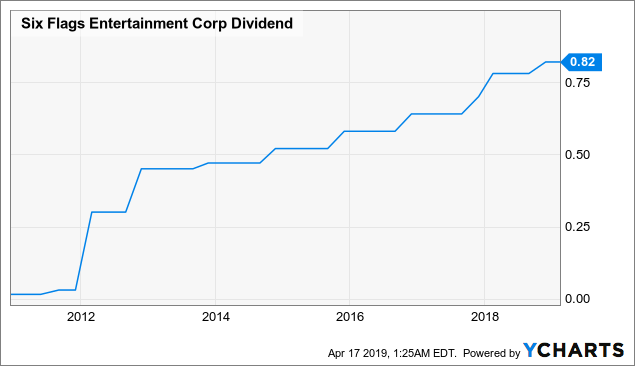 Six Flags shareholders have enjoyed a phenomenal bull run since 2010.
Dividend growth investors, especially, have benefited from the company's high yield and fast payout growth. And yet, sown into Six Flags' success are the seeds of its eventual destruction. As in the Great Recession, a substantial deleveraging could set the company up for another strong bull run during the next economic expansion. Before our hero can rise again, he must undergo the Dark Night of the Soul. 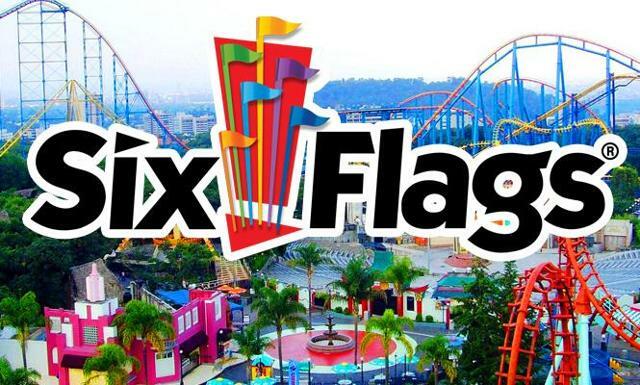 Now is not the time to invest, but Six Flags has the potential to make for a truly heroic investment if the right conditions emerge. I am a long-time connoisseur of theme parks. My family has taken fairly regular trips to Disney World since I was too young and scared to ride the Tower of Terror. (Although, to be fair, to this day I break out in a nervous sweat before riding it.) As a kid, I would go with my friends to Houston's AstroWorld before it closed - sadly - in 2005. Also, I first told my wife (girlfriend at the time) that I loved her on a ferris wheel in California. And last year, I surprised her with season passes to Six Flags (SIX) for Christmas. The excitement offered by these parks is timeless and not replaceable by TV or video games. For instance, Six Flags Fiesta Texas in San Antonio, Texas, recently added the Wonder Woman ride, and it is truly a thrill. Invest the time necessary to ride in the front seat. You will feel as invincible as Diana herself. Speaking of invincible, SIX stock performance has been doing a remarkable impression of Superman since the company's restructuring in 2010. It's a bird! It's a plane! No, it's Six Flags' total return! According to the company website, Six Flags is the largest amusement park operator in the world, with 25 properties throughout North America, including two in Mexico and one in Canada. The company also has several new parks in the pipeline in China and one in Riyadh, Saudi Arabia. Once you're in the park, there are literally no inexpensive food or drink options other than the occasional water fountain tucked away in a nook between shops. Perusing the menu for a while as a season pass holder tempts one to consider dropping a few hundred bucks to purchase food and beverage packages. SIX also features some special events at its parks, such as Halloween's Fright Fest, where it goes all out to scare the attendees (especially, for some reason, the teenage girls). Fright Fest offers guests a number of haunted houses and other special attractions that draw huge crowds from late September to mid-November. Maybe I'm just a scaredy-cat, but I found these haunted houses and the masked actors inhabiting them truly terrifying. Moreover, some walkways of the park are turned into haunted areas in which fog machines have made the man with the chainless chainsaw near-impossible to see coming. The first point goes without saying. SIX's business model is basically to stuff as many people in its parks as possible, and once they're inside, fleece them for as much money as possible. If people are going to spend the better part of a day at a theme park, cumulatively walking many miles, they're going to get hungry and thirsty. Eventually, they will break down and fork over the dough to purchase marked-up food and beverages. This is the high-margin portion of SIX's business. And it requires a sanguine and financially strong consumer. Over the past ten years, we've enjoyed ever-rising consumer confidence, but sentiment appears to have topped out in the past year or so. With less retained earnings, SIX has relied on the debt markets to fund its growth. This can work for a time, but not forever. 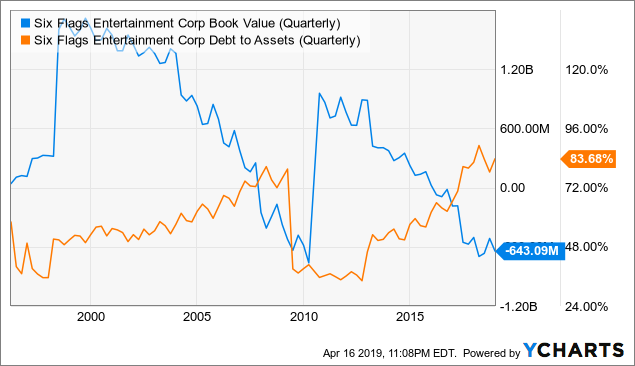 Interestingly, SIX's book value shrinks during economic expansions, mainly for two reasons: (1) Many of its assets are intangible, including licenses for the Warner Bros. and DC Comics characters, and (2) debt creeps up during expansions, while deleveraging has only occurred a few times in the past few decades - one of those times being the Great Recession. The catalyst for this deleveraging was the Chapter 11 bankruptcy filed in June 2009. Liabilities have piled up again, and now outweigh tangible assets by around as much as they did just prior to the bankruptcy. After the restructuring in 2010, when bondholders were handed the keys to the company (alongside new shareholders who had put up $750 million in new equity), SIX enjoyed positive working capital (i.e., cash available to pay workers and ongoing expenses) for a few years. 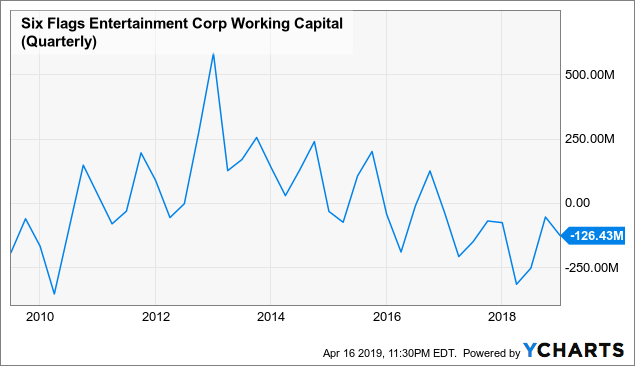 You can tell based on the chart below that busy season (summer) has kept working capital above water most years of the past decade. 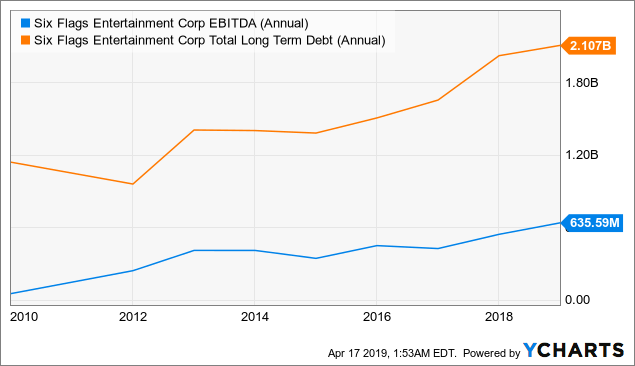 But now, with a debt-to-EBITDA ratio of 3.3 and total debt ($2.11 billion) almost half its market cap ($4.27 billion), the company appears close to its previous breaking point. A recession could certainly tip the company over the edge. It may not (and likely would not) result in another bankruptcy, but it would likely result in another forced deleveraging scenario. This would reset the company back to the place it was in after the Great Recession - rich with valuable assets and burdened with much less debt. The company does well when the American consumer is doing well. As the financial strength of the consumer has improved over the past decade, so too have the good fortunes of SIX. 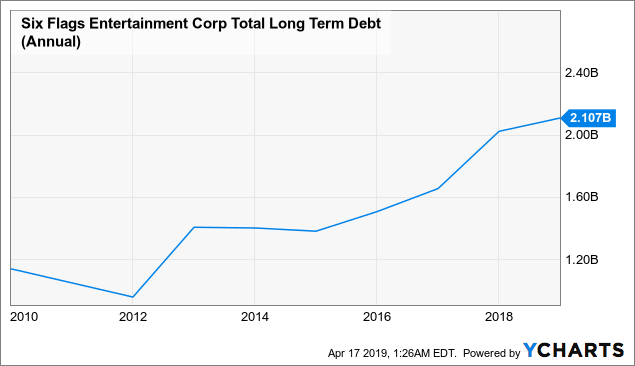 And yet, as we've seen from its debt buildup, the company's success during the current economic expansion contains the seeds of its own demise. 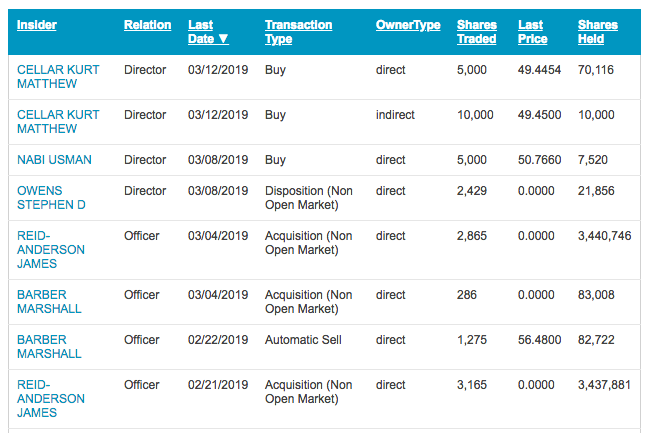 You might object that insiders own a considerable amount of the company and have been buying recently. Indeed, insiders own around 7% of SIX's shares and have been buying around $49-50 per share in the past month or so. It is somewhat reassuring to see insiders putting their money where their mouth is, but it doesn't change the issues mentioned above. While insiders know a good bit more than the average investor, they are not all-knowing. They do not know, for instance, when the next recession will come. 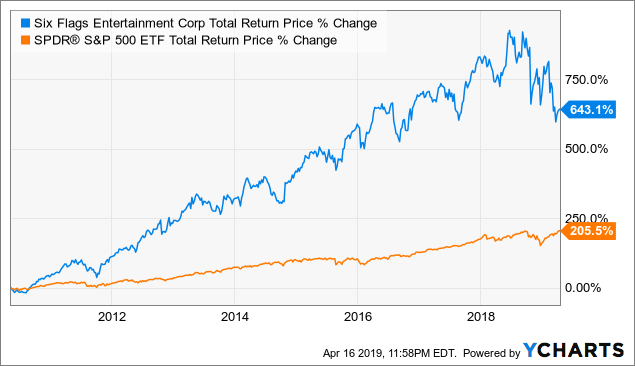 Cedar Fair was trading around $27-28 in 2006 and 2007, while paying out a generous dividend. 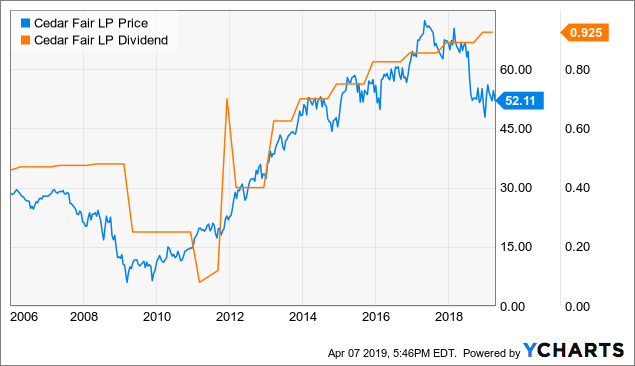 But notice that the stock price began to drop about a year prior to the actual dividend cut, anticipating it well in advance. 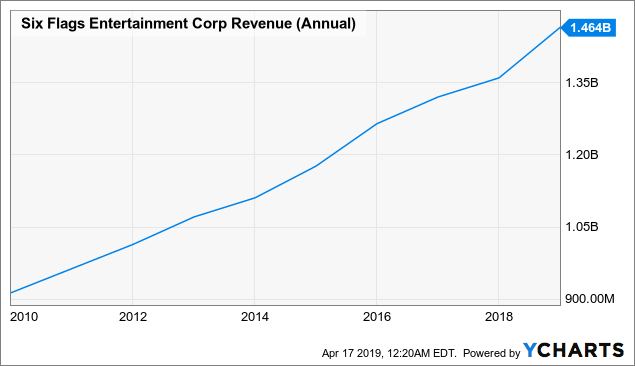 The price has been doing the same thing since the Spring of 2018, when the company announced attendance and revenue declines at its parks. This at a time when one would think (based on the data that gets the most media attention) that the American consumer is financially strong. After all, in 2018, unemployment was low and falling, and wages were rising. And yet, park attendance was weakening. Could SIX show similar signs of a slowdown in traffic and revenue as Cedar Fair? It hasn't yet, though the stock price has been tripped up in the last several quarters. One thing that simultaneously attracts me to the stock and gives me pause about the current timing is SIX's return on invested capital. Though quite strong now, having hovered above 15% for over a year, the company's ROIC only crawled back above zero in late 2011, a few years after the onset of the Great Recession. 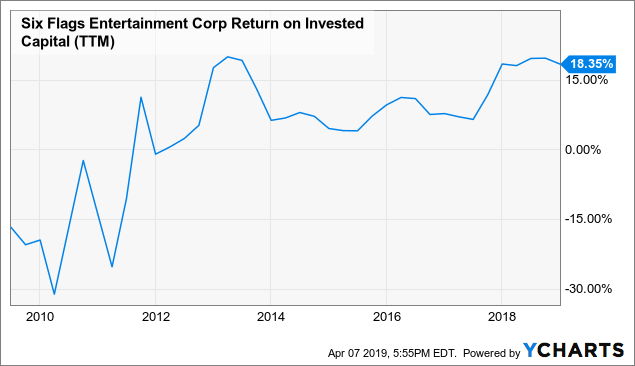 The return on SIX's investments turned negative during the Great Recession and in the years after, as it took a long time for consumers to become ready to spend again on theme park trips. But when the economy is good and consumers are doing relatively well, the company's ROIC is vigorous. Compare the current 18.35% ROIC to the company's weighted average cost of capital of 7.97%, according to GuruFocus, and you come up with a positive spread between the two of more than 10 points. This is a positive sign for the short term, but ROIC may slip down again into territory which would make the spread between ROIC and WACC negative. SIX now has a debt-to-assets ratio that is higher than the point just prior to its bankruptcy in 2009. Since the company's return to profitability in 2012, the gap between earnings and debt has widened. This is a set-up for another painful deleveraging. But such a deleveraging, if it were to occur, would also set the stage for another Superman-esque bull run. Especially if the company raises the dividend payout by 10%+ annually in the next expansion as it has done throughout the current one. SIX's asset base is strong. Its parks continue to attract large crowds and are finding ways to empty the pockets of its guests while keeping smiles on their faces. This is one mark of a strong company. But another mark of a strong company is a strong balance sheet. When Superman (i.e., Six Flags) finally comes to acknowledge the burden of the kryptonite (i.e., debt) around his neck and flings it off (in the next recession), the Man of Steel may once again become a powerful investment opportunity. Superman need not be fully free of the kryptonite, but once he has made substantial strides to remove it, his strength should start to show once again. Until then, I will keep an eye on that kryptonite and hold back my investment dollars.